Marian Jean Skellion, 95, of Paducah, passed from this life, on Friday morning, March 29th, 2019 at Baptist Health of Paducah. 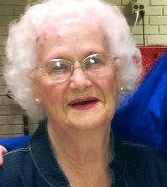 Marian was a retired bookkeeper in the medical field for Dr. Bill Shidel in Paducah. She also was a member of Margaret Hank Cumberland Presbyterian Church of Paducah. Marian is survived by one daughter, Vicki (Charlie) Ross; one son, John (Darlene) Skellion III; four grandchildren, John, and Ginny Ross, Jennifer Dabel, and Mike Skellion; and four great grandchildren. She was preceded in death by her husband of 54 years, John Skellion Jr.; two brothers, Howell Hodges and W.G. Hodges Jr.; her parents, W.G. and Nell Hodges; and special uncle, Henry Ward. Friends may visit the family on Friday, April 5th, 2019 at Lindsey Funeral Home from 9am until 11am. Memorial services will start at 11am following visitation with Rev. Jim Smith officiating. Burial will follow at Mt. Kenton Cemetery.